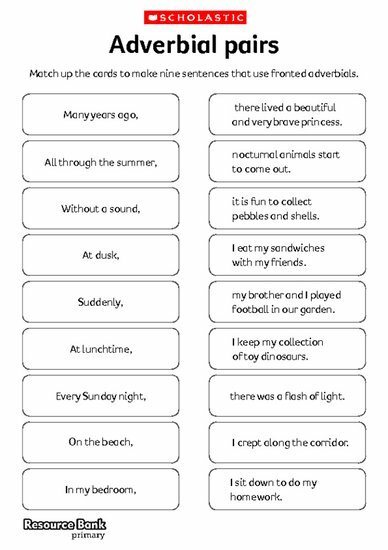 This activity familiarises children with fronted adverbials, and gives them an opportunity to practise using them orally in sentences. Model for children what a fronted adverbial is, and where it goes in the sentence. Then give out the Adverbial pairs cards. Working with a partner, children should take turns to turn over two cards and see if they can form a sentence that makes sense, using a fronted adverbial card (recognisable because it is followed by a comma) and a matching pair (ending in a full stop).